A Diverse, Equitable and Inclusive Workplace Won’t Build Itself. Leaders Must Proactively Build One. Building diverse teams is increasingly becoming critical for leaders across industries — and with good reason. To be effective, teams require a broad range of thought and experience, and many studies have proven that diverse teams are smarter, more innovative and deliver better results. But if you want your organization to be successful, your team is only part of the equation. Another key part? Building an inclusive, equitable workplace culture where employees from all backgrounds will not only succeed, but will feel valued and welcomed. As president of Ithaca College, and in my previous roles as a senior leader at Middlebury College and Rutgers University—Newark, I’ve been deeply invested in the important work of building diverse teams and inclusive cultures at institutions of higher education for close to two decades. These are critical priorities for a sector that serves a rapidly changing student population and shapes the worldview of our country’s next generation. Diverse teams leading colleges and universities are not only better equipped to serve students, they can also model what inclusive cultures look like. This is especially crucial when students become alumni and enter the workplace with a deeper understanding of the importance of diversity and inclusion than previous generations. Whether in higher education, business or the nonprofit sector, cultivating an equitable, inclusive workplace culture requires time, dedication and a highly collaborative approach. Investing in this work is something leaders in all industries and from all backgrounds can — and should — do. Here are three practices that can help you and your team build a more inclusive culture that will allow diverse talent to thrive in any organization and any sector. Dr. Shirley M. Collado with students. Soon after I arrived at Ithaca College, our senior leadership team went on a retreat so, together, we could frankly discuss our values, lived experiences and goals, especially our collective commitment to creating a culture that encourages full participation. Dedicating time and space away from campus enabled us to get to know one another, helped me to explain my priorities and values as a leader and provided a permission structure to openly discuss our respective experiences, perspectives and priorities. This is just one example of how to empower your team to develop trust and engage with one another in challenging conversations around identity and community. It is a springboard for jump-starting longer-term efforts to weave diversity and inclusion practices and goals across all levels of your organization. But lasting progress requires more than one retreat or conversation with your team. It demands that you provide ongoing support and resources to them to promote these values within their own ranks. These tools could include targeted professional development opportunities with peers or other leaders, key reading material, or trainings. The responsibility for building a more inclusive culture can’t reside only with the head of an organization. It requires the engagement of leaders at every level to ensure that you’re incorporating perspectives from all areas and creating a broad understanding that diversity and inclusion are indispensable to your organization. The more people who activate and live these values, the more it becomes part of the hardwiring of your workplace. First, identify and cultivate allies within your organization who will reinforce your efforts. Shifting an organizational culture can be incredibly difficult, and when you find other leaders willing to be champions you will generate greater impact faster. Second, empower leaders and departments throughout your organization to share accountability for building an inclusive culture. One way to do this is to encourage broad collaborations on projects or initiatives. This will enable more leaders and staff members to feel invested in decisions and outcomes related to your overall organization. Lastly, avoid asking members of historically underrepresented groups to lead the lion’s share of this work. Everyone has a stake in the conversation and in the effort to build a culture that values and prioritizes full participation and collective accountability. In fact, encouraging leadership from unexpected places reinforces the idea that a diverse and inclusive workplace benefits everyone and all members of an organization should share responsibility for promoting them. At Ithaca College, for example, monthly diversity and inclusion discussion circles were established and led by our then-CFO — not typically a role one would associate with opening campus community conversations about challenging cultural issues. These discussion circles continue and have become a regular gathering time that staff, faculty and students across campus rely on for learning about different topics such as disability inclusion and implicit bias. The discussions have evolved, and this year all members of our Senior Leadership Team will host one of the conversations. This is just one way that our college has set the expectation that our entire leadership team shares responsibility for building an inclusive work culture, regardless of professional expertise. First, start with diversity and inclusion when thinking about what you would normally consider mainstream functions of an institution. For example, a strategic planning process is one of the most important things an organization can do. What if you began that process by locating full participation, equity and inclusion at the core of your work? Instead of creating special task forces or committees that keep marginalized ideas and experiences at the periphery, organizations can infuse these values at the start of this critical planning process, firmly establishing that these principles are a part of everything an organization does, not simply a lens to be applied to an existing effort. Second, if you want your team to prioritize diversity and inclusion, you must clearly position these principles as central tenets of your organization’s mission — not just as one special or short-term goal. Make it clear that these values are integral to your organization’s DNA. An inclusive workplace culture won’t build itself — it requires leadership and commitment from your entire team. While there is no one-size-fits-all solution, aligning your leadership team on goals and sharing responsibility throughout your organization for meeting those goals are critical foundations for building an inclusive workplace culture. In the twenty-first century workplace, this is imperative to your organization’s success. 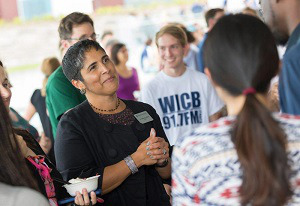 Dr. Shirley M. Collado is the president of Ithaca College.